DQE’s fiber optic network continues to grow, with approximately 140 route miles to be added to our network in 2019 to create a ring around Armstrong County, PA. We look forward to building partnerships in the area with our reliable network solutions built to grow with your business. View our latest Network Map for an interactive visual of our current 3,362 fiber route mile network. To promote STEM Week in Pittsburgh, DQE’s President & CEO Jim Morozzi was interviewed on KDKA’s Showcase Pittsburgh discussing the importance of STEM, and how DQE strives to provide innovative data solutions that foster technology growth in Pittsburgh. 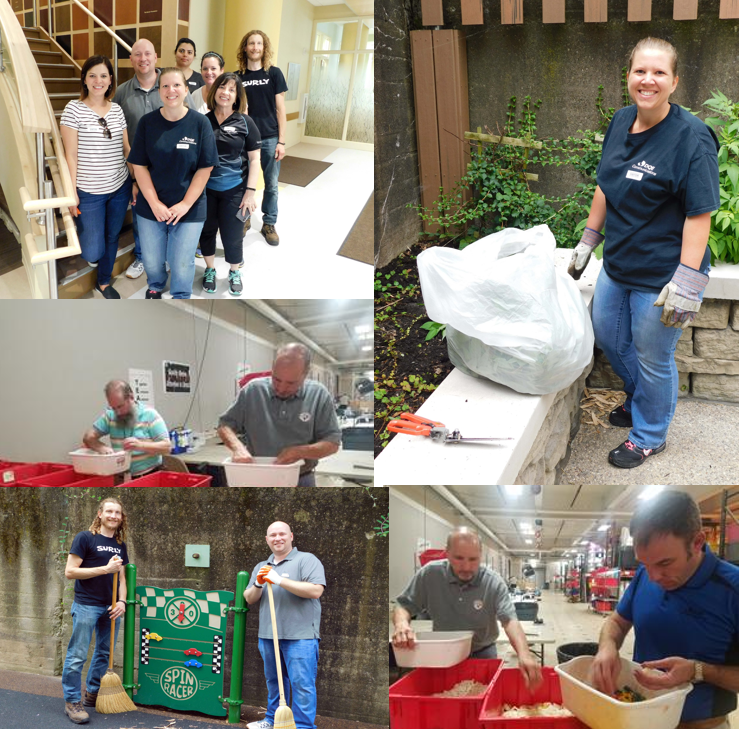 A group of DQE Communications employees partnered with two local organizations to complete various tasks for a Volunteer Day on August 9th. One group of volunteers visited ASSET STEM to disassemble and organize approximately 300 STEM Kits for students of the school. This organization provides access to schools and education organizations to provide proven and cost-effective tools, resources and strategies to advance teaching and learning for effective inquiry-based teaching and learning. Another group of volunteers visited the Women’s Center & Shelter of Greater Pittsburgh to clean and organize their facility for a family-friendly carnival. This organization provides safety, shelter, support and guidance to all victims of domestic violence. Learn more about ASSET STEM here, and the Women’s Center & Shelter, here. DQE associates are already looking forward to the next volunteer day, tentatively scheduled for November. DQE’s IP Engineer Steve Puluka was recognized by Juniper Networks JNET Community for providing the most User Accepted Solutions over the last 3 months. Congratulations to Steve on this accomplishment! DQE Communications’ Customer Appreciation Golf Outing was Tee-rific! Over one hundred customers attended the 5th Annual DQE Customer Appreciation Golf Outing at Sewickley Heights Golf Club on June 11th, 2018. Customers began to arrive around 10:30AM, receiving a DQE Communications 3-in-1 Golf Ball Marker/Clip/Bottle Opener combo at registration, before heading to the patio for a complimentary cookout luncheon. A noon shotgun start kicked off this scramble style competition. After a few hours on the course, customers were treated to cocktail hour, followed by a delicious dinner and award ceremony, with recognition given on six contest holes, the best scoring team, and those who put forth their best effort. Thanks to our partnerships and donations, lucky raffle winners walked away with great prizes including top-of-the-line golf supplies, autographed Penguins, Steelers + Pirates memorabilia, and more! For the 5th year in a row, DQE hosted a successful outing as a fun way to show our customers’ our appreciation for their continued business. Thank you to the partnerships that helped make this day memorable for all: 93.7 The Fan, American Specialty Services, Inc., Comstar Supply, Ekinops, Etzel Engineer & Build, FCSI, Inc., Keystone by Design, Magna5, NFM+Dymun, Pittsburgh Area Airport Chamber of Commerce, Pittsburgh Tech Council, The Pittsburgh Pirates, Print Tech, Scanlon Fiber Optics, Sewickley Heights Golf Club, Walker & Associates and WTAE. PITTSBURGH – DQE Communications, a major provider of data networking services for businesses in southwestern Pennsylvania, has launched Cloud Solution, a new product that allows companies to connect directly to top-tier cloud service providers. DQE’s Cloud Solution gives businesses a private connection to service providers like Amazon Web Services and Microsoft Azure/Office 365, bypassing the public internet. Any enterprise-type company could benefit from this private connection, which improves security and performance. “Cloud Solution is for business and government organizations that want dedicated and private connections to their cloud provider for a quicker, secure and more consistent network experience than typical internet connections. In fact, Cloud Solution is a logical and reliable choice when organizations need a diverse connection to their cloud provider,” said Ross Henzel, director of business development for DQE Communications. More information can be found about DQE Communications at www.DQECOM.com. Headquartered in Pittsburgh’s SouthSide Works development, DQE Communications provides high-speed, fiber-optic data networking for businesses, governmental agencies and carriers. The company’s network of fiber-optic cables currently spans 3,050+ miles throughout western Pennsylvania, and on into northern West Virginia. Already in over 1,500 commercial buildings in the region, DQE Communications is continually working to expand its network. DQE Communications’ services include Metro Ethernet, Wavelength, Internet, Dark Fiber, and Colocation. An unregulated subsidiary of Duquesne Light Holdings, DQE Communications was established in 1997. For more information, visit www.DQECOM.com or call 1-866-GO-FIBER.